Wow, I even read the comic and I never put together that the bad guys were working a theme when they all showed up in issue #1. Thanks, back-of-the-card info! Clearly, Strictus is a rattlesnake, which throws his name into question: rattlesnakes kill with their venom, not by constriction. He only uses the normal Minimate torso and arms - the rest of his pieces are all new molds. 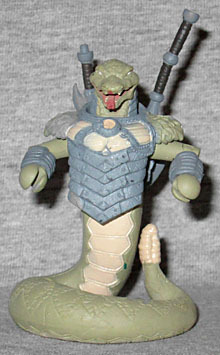 His chest cap provides segmented armor and a little bit of fur at the shoulders, his head has armor on the sides of the neck, and instead of legs, his entire lower body is a coiled snake tail that just screams for a custom Medusa or Golobulus. Strictus is armed with two bladed weapons, one short and one long. They can be plugged into his back when not in use. Oh, and in a completely undocumented feature, they can be joined at the hilts to form a single, double-bladed weapon! A linguist at the Department of Defense, Bliss translated the scrolls found alongside the Praxis of Hope. Upon speaking aloud the activation phrase, she alerted Beasts everywhere to the location of Earth. Bliss Reynolds is our POV character for the Battle Beasts comic, the human stuck at the center of all the craziness. 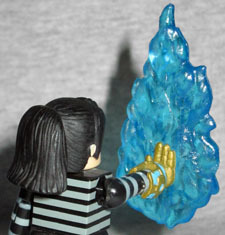 She also answers the question "what if somebody drew Zooey Deschanel into a comicbook and then made a Minimate of that?" Not since Samuel L. Jackson showed up in The Ultimates has a character so clearly been designed with the hopes that a specific actor would play them in the movie. The plot of the comic series takes place over the course of a single afternoon, so none of the characters change clothes. 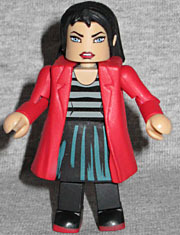 Bliss is wearing her red jacket (though the set does include arms to match her striped shirt if you want to take it off). Her skirt, which was dark green in the book, is here black with some blue highlights to suggest wrinkles on the front. She's wearing black leggings, and red shoes. Her black hair is pulled back into a wide ponytail - a new piece, but it doesn't quite get her bangs right. Bliss also comes with a golden glove with blue detailing, so this seems like a good time to explain what this "Praxis of Hope" (that the bios keep mentioning) is. Also known as "the Dread Weapons," they're ancient artifacts. There are seven in total. Each imbues their owner with different abilities. Put together, almost anything is possible. They were the pinnacle of the Beasts' war technology. The devastation they are capable of is awe-inspiring. They's also shown to be silver, not gold, so "whoops"? It's molded with the palm facing out, like an Iron Man Replusor blast, but a hole in the palm allows the included translucent blue flame shield to plug in (in theory, at least - in practice, it keeps popping off). In order to make back some of the money being spent on all these new molds, the Battle Beasts had TRU-exclusive repaints, half of them representing different characters. 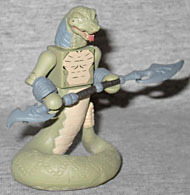 There is no TRU version of Bliss, but the TRU rattlesnake, Scalpus, is a more vibrant green and has silver armor. It looks more "snakey," but less like a real rattlesnake, so you'll have to decide which one you like better. ...I am now considering this pack for the woman. Her torso would make a great start to a custom of Elisa Maza.